I'm a sucker for ugly game-themed shoes, but even I wouldn't pick these bad boys up. 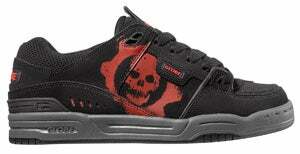 Featuring a blood-red COG symbol, these custom Globe skate shoes sell for $80. GEARS OF WAR Globe has teamed up with Epic and their Gears of War video game, one of the best-selling combat video games of all time, to bring you a Special-Edition Co-op shoe based off of Globe's Fusion model. This one comes with a big pop of the Gears of War icon, inside and out.